Passionate undercurrents sweep in and out of this eloquent novel about a love affair in a summer countryside in Italy and its inevitable end. It takes place in a setting of pastoral beauty during a time of celebration--a festival. Sophie, half English, half Italian, meets Tancredi, an Italian who is separated from his wife and family. In telling the story of their love affair, Shirley Hazzard punctures the placid surface of polite Italian society to reveal the intense yearnings and surprising responses in sophisticated people caught up in emotions they do not always understand. 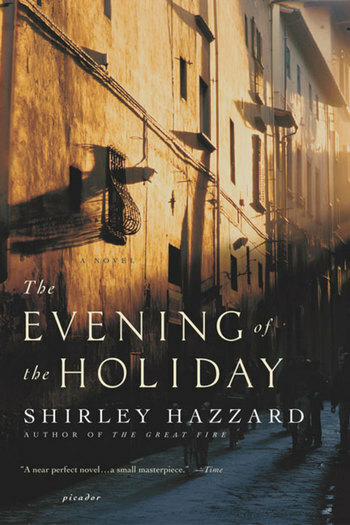 Shirley Hazzard (1931-2016) is the author, most recently, of Greene on Capri, a memoir of Graham Greene, and several works of fiction, including The Evening of the Holiday, The Bay of Noon, and The Transit of Venus, winner of the 1981 National Book Critics Circle Award. She lived in New York City and Capri.